Neuroscientists at the University of Rochester Medical Center (URMC) have a powerful new state-of-the-art tool at their disposal to study diseases like Autism, Alzheimer’s, and traumatic brain injury. The Mobile Brain/Body Imaging system, or MoBI, combines virtual reality, brain monitoring, and Hollywood-inspired motion capture technology, enabling researchers to study the movement difficulties that often accompany neurological disorders and why our brains sometimes struggle while multitasking. The MoBI platform – which is located in the Del Monte Institute’s Cognitive Neurophysiology Lab – brings together several high tech systems. Using the same technology that is employed by movie studios to produce CGI special effects, study participants wear a black body suite that is fitted with reflective markers. Participants are then asked to walk on a treadmill or manipulate objects at a table in a room fitted out with 16 high speed cameras that record the position of the markers with millimeter precision. This data is mapped to a computer generated 3D model that tracks movement. While they are walking, a virtual environment – a cityscape, for example – is projected on the screen in front of them which they must navigate. They can also be asked to perform task and make decisions in response to what is being projected on the screen. While this is occurring, the brains of study participants are monitored via a high-density electroencephalogram (EEG) that detects electrical activity using small metal electrodes attached to the scalp. 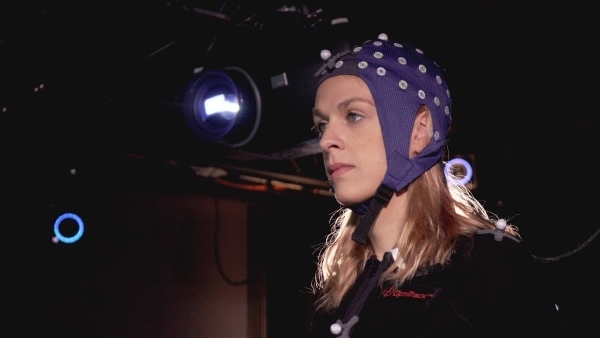 The motion tracking and EEG data are synchronized, allowing researchers to track which areas of the brain are being activated when walking or performing task and study how the brain responds while moving, performing tasks, or doing both at the same time. This information could provide new insight into developmental diseases like Autism, which is often characterized with difficulty in processing sensory information from multiple sources. Individuals with Autism also often have an abnormal gait. People with Alzheimer’s, dementia, and sports concussions also experience movement difficulties. The researchers are currently using MoBI to establish a set of data with healthy individuals. This baseline of brain activity can then be compared to people with neurological disorders to identify new “signatures” of disease and brain processes that can be employed during clinical trials.